Graham Arnold made two changes from the 2-2 draw with Melbourne Heart. The injured Marcel Seip was replaced by Zac Anderson while Mile Sterjovski dropped to the bench for Michael McGlinchey’s season debut. Having had to make a number of changes last week to accommodate their suspensions, Gombau brought Isaías Sanchez and Nigel Boogard back into the starting line-up. Cirio moved back to the left wing as Isaías took up a more advanced position in the midfield triangle, which was instead anchored by Osama Malik. Michael Zullo continued at left-back. Although the only goal came early in the match, this was still an exciting and engaging encounter. 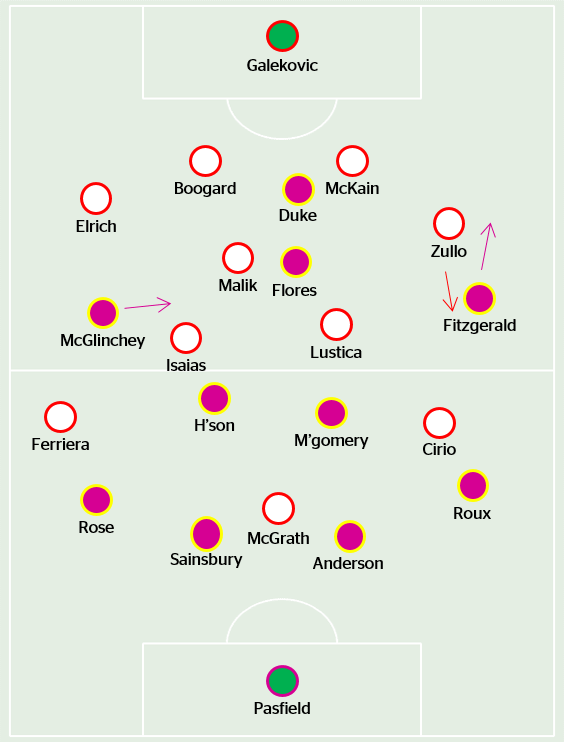 The match had barely started, let alone settled into a pattern, before Fitzgerald scored – but as it were, the ‘location’ of the goal, from the right flank, was fitting of the major tactical issues. Interestingly, the Mariners hit lots of long balls over the top in the general direction of Mitchell Duke in the opening ten minutes, almost if they wanted to test Adelaide’s high line after seeing it exposed so frequently by the Melbourne Victory last week. A key issue was the fact Adelaide’s full-backs were very keen to stay tight to the Mariners wingers. Therefore, when Nick Fitzgerald and Michael McGlinchey moved towards the play, there was room down the sides for overlapping full-backs. At one point Zullo shouted angrily at Cirio to track Storm Roux’s forward runs, while on the opposite side, Rose would have had an assist if Fitzgerald’s first time shot from his low cross not cannoned off the crossbar. McGlinchey’s movement inside also proved instrumental in terms of the midfield battle. Like in the Victory clash last week, the two facing forward in Adelaide’s central triangle, Steven Lustica and Isaías, moved forward to pressure the two deepest midfielders in the Mariners 4-2-3-1, John Hutchinson and Nick Montgomery. That left Osama Malik to pick up Marcos Flores, but with McGlinchey drifting inside, the Mariners had a 4v3 advantage in that zone when they had possession. It also benefitted Flores, who found pockets of space either side of Malik to hit probing forward balls, especially towards the right. The fact Zullo was marking Fitzgerald so tightly is pertinent – the latter could drag his defender into awkward positions and thus open up space in the right-hand channel for Duke to move into. The striker often peeled off the shoulder of Jon McKain to receive long direct passes down the right, taking advantage of the space Zullo’s aggressive defending was creating. Furthermore, Zullo was very keen to get forward on the overlap when Adelaide had possession, leaving vacant space in the left-back zone that the Mariners frequently counter-attacked towards. There was a moment when Justin Pasfield hit a drop-kick almost seventy yards onto the feet of Duke – not only was the accuracy of the kick very ‘Ryan-esque’, but it showed where the space was for the Mariners. It’s always difficult to quantify defensive patterns, but the location of Zullo’s tackles – high up the pitch – are instructive. The Mariners created a few half-chances from this pattern of play – McGlinchey’s shot in the 35th minute went just wide of the near post after Duke’s cross evaded all of the Adelaide defenders, while Fitzgerald had Zullo beaten for pace and twice latched onto a Flores through-ball to hit a ground cross across the face of goal. Flores was very good – not only was his defensive role energetic and purposeful, but he linked up intelligently in the final third and contributed to the Mariners bias down their right hand side. Ironically, the only goal could have been prevented if Zullo had been tighter to Fitzgerald – instead, the defender overcommitted as Fitzgerald cut inside, giving him time to curl a shot into the far corner. That, though, might have been why he was so determined to mark him closely for the rest of the match. However, the key feature of the match was the overall, broader battle between Adelaide’s possession, and the Mariners defending. As we’ve come to expect, the Mariners defended in two solid banks of four, with little space between the lines. Again, as we’ve come to expect this season, Adelaide dominated possession – 66%, to be exact – but were unable to transition control in deep positions into effective penetration high up the pitch. Quite incredibly, the top ten pass combinations were all between Adelaide’s ‘back six’: the defence, Galekovic and Malik, who dropped into the centre of defence when Adelaide had possession – but they were always playing in front of the Mariners, rather than dragging them out of shape. Compare that with the distribution of the same centre-back pairing from the opening round win over Perth: lots of square balls, yes, but also a statistically obvious willingness to move forward on the ball. What, then, was the difference? The absence of Jeronimo Neumann is an obvious explanation for Adelaide’s lack of penetration, as is the loss of Marcelo Carrusca. The playmaker does an excellent job finding space between the lines and links up intelligently in the final third. However, the comparative passiveness of Perth’s defending compared to the Mariner’s is most significant. Alistair Edwards instructed his son, Ryan, to man-mark Isaías, told the middle four to drop back to halfway, leaving Jamie MacLaren to cover the distance between the two centre-backs. Graham Arnold, by contrast, was happy to allow the defensive midfielder (Malik, in this game) to go free into the back four. Flores and Duke instead focused on blocking off passes into midfield. They didn’t just sit off, though. When the ball was played backwards, the Mariners front four moved forward in sync to close down the next pass – with their wingers moving forward onto the Adelaide full-backs – which tested Adelaide’s ability to play out from the back. The away side were nearly caught out on a few occasions. However, as the second half progressed, the Mariners sat deeper and deeper, so Adelaide’s passing becoming more accurate – not necessarily more penetrative, though. It’s worth commenting on Isaías’s role. In the first round, he was the deepest midfielder, but in Carrusca’s absence, was the “second function” midfielder here. Adelaide under Gombau always look to work the ball to players between the lines, but with Montgomery and Hutchinson holding the central space in front of the back four, Isaías often moved into wider positions just to the left of Hutchinson. The teammate alongside him in the midfield triangle, Lustica, found it more difficult to find space, though, and after dropped into left-of-centre positions inside his own half to receive the ball. There was some midfield rotation – there were a few moments when Hutchinson was drawn upfield, as if he was confused about who to pick up. Both sides used their full complement of substitutes, but as six like-for-like changes, none had a particularly significant influence on the match. This was Adelaide’s first match under Gombau against a side whose defensive organisation is their strength. There’d be no better way to illustrate the strengths of a new coach’s playing style than beating the best defensive team in the competition. The fact Adelaide were defeated isn’t evidence of the fallacies in the ‘Barcelona’ system – instead, it’s an obvious illustration of the difficulties we already knew existed when a possession-based side has to break down an organised defence. Gombau won’t change the system: for him, it’s a matter of his side becoming ‘so’ good at their style that it’s their opponents, and not Adelaide, that are forced to change. And in saying that, neither side changed their approach for this match: for all the tactical nuances, it was almost simply a matter of one side being more effective in their execution.